While he’s been the favorite whipping boy of Minnesota Wild fans this season, Thomas Vanek’s absence has created a big hole for the Wild in their first round series against the Dallas Stars. It has been the least productive season of Vanek’s career, scoring fewer than 20 goals and 48 points for the first time in his career. Nonetheless, the Wild are worse off without him in this series. Vanek was injured in a March 29 game against the Chicago Blackhawks. He played the next game, but wasn’t able to make an impact and had his ice time limited. In addition to losing seven straight games, they have scored the fewest goals in the NHL since April 1, both in all situations and even strength. That includes teams who didn’t make the playoffs, giving the Wild an extra two games on many of them. They have just five goals in those six games. From Feb 15, when Coach John Torchetti took over, until March 31, the Wild scored the third most goals in the NHL and the fourth most even-strength goals. It’s just another piece of this season’s Jeckyll and Hyde routine, where they had a franchise-best start to the season, then lost 13 of 14 early in 2016. That resulted in the firing of Coach Mike Yeo and saw them back their way into the last wild-card spot in the Western Conference. Since Vanek was injured, the team has struggled. Part of their struggles has certainly been the absence of Zach Parise in the last two games. Being without Erik Haula in Game 1 didn’t help either. Neither has their frustrating penchant for streakiness. Yet, a myth persists that the Wild are somehow better off without Vanek, or that a Vanek who doesn’t produce like he did in his prime isn’t a valuable commodity for Minnesota. The Wild have been as defensively sound as they’re likely to be, and that’s maybe good enough to get some wins if they can get some more pucks on and in the net. This season, Vanek has the team’s fifth highest shot rate at 6.39 shots per hour of even-strength play. He has the third best point rate on the team (1.6 P/60), the second best primary assist rate (0.80 First A/60) and the sixth best goal rate (0.67 G/60). Vanek’s absence is a serious loss in the offensive zone, and that loss goes beyond rates and raw totals to the role he plays. Looking past having another scorer in the lineup, Vanek offers something the Wild need against Dallas, and that’s pressure in the slot. Dallas is a team who has not gotten great goaltending. The team’s .917 even-strength save percentage is the fourth worst mark in the NHL and the worst among playoff teams. Among the 69 goaltenders who played at least 400 minutes this season, Kari Lehtonen ranks 60th in even-strength save percentage. If you start to pull that apart — and watch his rebound control — Lehtonen ranks 42nd in low-danger save percentage. He ranks 60th in high-danger save percentage, and that may be a generous ranking based on his late-season performance. From Feb 1 through the end of the season, no goaltender in the NHL had a worse high-danger save percentage than Dallas’s Finnish netminder. Here’s a look at Lehtonen’s save percentages over the last two seasons. It’s not good, but it’s worth keeping in mind that he hasn’t always had a lot of help. Dallas has allowed more shots in the slot than the league average and opponents have had an above league-average shooting percentage against the Stars from the slot as well. 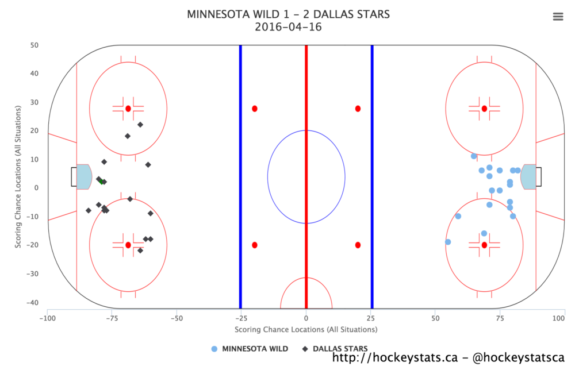 In Game 1, the Stars did a great job keeping the Wild from having too many chances in that region. Below are the scoring chances in Game 1. The Wild managed just a single high-danger scoring chance as defined by War on Ice (chart via Hockeystats.ca). 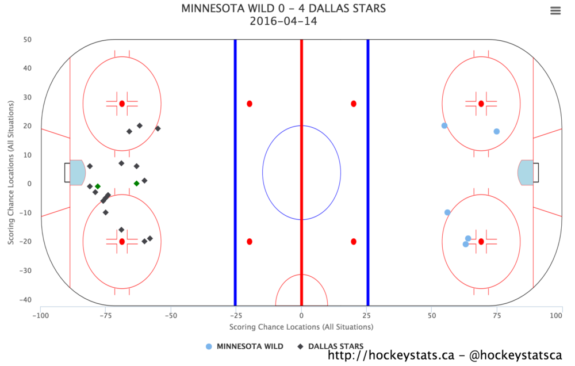 The Wild improved significantly in Game 2. 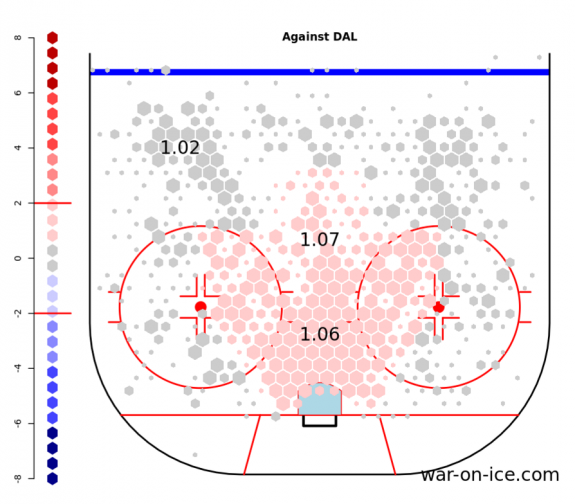 War on Ice has high-danger scoring chances even at 10-10. There was more success at large for the Wild, but also a focus on pressuring Lehtonen in close. Teams, naturally, want opportunities in tight, because an opportunity in the home plate area is more valuable than a shot produced from the perimeter. 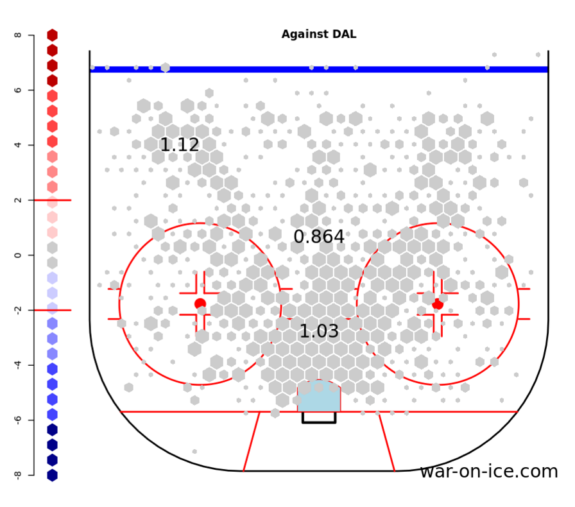 But there’s additional reason to make that push with Lehtonen’s struggles. Here, again, the Wild could use Vanek. He’s not only an adept scorer and playmaker — even if he’s much less so than he used to be — but he thrives around the net. The below heat map of Vanek’s shot attempts from Corsica.Hockey shows a player whose wheelhouse is Lehtonen’s Achilles heel. That may be part of why Vanek had five points in five games against the Stars this season, second most on the team. Discounting Vanek’s impact, even when he’s producing at a career-low rate, discounts that he’s still having a significant impact on the team offensively, where they are struggling most. Moreover, his impact against Dallas may bear special significance, particularly when the Wild don’t have the depth to replace Vanek’s offense, let alone the offense lost when he and Parise are forced onto the shelf.